The website Aangirfan describes a asymmetric counter intelligence operation – originally designed as a “stay behind operation” for defending a country, but later turned back in on itself and unleashed to terrorize the ‘Homeland’ (Europe, North America) as a means of manipulating political, social and military outcomes, defense spending – at home. This is not a conspiracy theory – it’s historical fact. “UK Police are being given more powerful guns and extra training to prepare for a possible Mumbai-style terror attack in Britain. 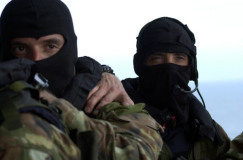 Security chiefs are staging a series of terrorism exercises with police sharpshooters training alongside units of the notorious Special Air Services (SAS). Apparently, the development follows the discovery, in September 2010, of a credible ‘CIA-NATO Gladio-style’ false flag plot. How is this related to ISIS and al Qaeda in Syria? This depends on whether or not you are willing to join these dots. How much training have the SAS been giving to Jihadist terrorists in Jordan and Turkey? We look at this as a successful, tried and true method of divide and conquer – with fingerprints left all over the world during the 20th and 21st centuries in places like Northern Ireland, Vietnam, Italy, Greece, Turkey, Belgium, the Philippines, Kenya, Sri Lanka, El Salvador, Nicaragua, Columbia, London, Madrid, Los Angeles, New York and later in Iraq, Libya, the Ukraine and now in Syria, and many other places still. Episode #113 of the SUNDAY WIRE heard host Patrick Henningsen in an incredible in-depth discussion with Irish writer and political affairs analyst Gearóid Ó Colmáin, as they delved into this hidden world of secret wars, gangs and counter-gangs, as outlined in the seminal book on this subject, written by British General Frank Kitson, entitled “Gangs and Counter Gangs“. It’s a near playbook and instruction manual for inducing instability. On 30 January 2010, we learn that NATO generals devised Operation Cage (Cage probe deepens with Poyrazköy indictment) which included the idea of detonating explosives during school field trips to military museums in Turkey. The intention was to kill lots of kids. The UK’s General Frank Kitson reportedly developed the idea of the ‘pseudo gang’ (General Frank Kitson: Trail Blazing Fake Terrorism). In 1984, a squad of US Marines was parachuted into Belgium, and met by a member of the Belgian military intelligence (NATO, Gladio and the strategy of tension. N.A.T.O stay behind). They hid for a fortnight before attacking the police station in Vielsalm. Weapons and ammunition were stolen. A Belgian police officer was murdered. In 1991, a Belgian Senate investigation proved that this attack was the work of the American and Belgian military. Groups of armed men would burst into restaurants and supermarkets and start shooting.